Oak Harbor is a city located on Whidbey Island in Island County, Washington. To see ratings, more things to do, photos, and other tourist information, read Oak Harbor trip itinerary maker website . The Route module can give you travel options from your home to Oak Harbor. Expect a daytime high around 69°F in August, and nighttime lows around 54°F. You'll set off for Portland on the 24th (Sat). 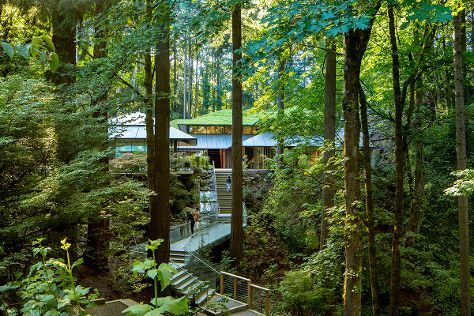 Start off your visit on the 24th (Sat): admire the natural beauty at Lan Su Chinese Garden, stop by Powell's City of Books, contemplate the long history of Pittock Mansion, then take in nature's colorful creations at International Rose Test Garden, and finally admire the natural beauty at Portland Japanese Garden. To see ratings, maps, more things to do, and more tourist information, read Portland holiday website . Use the Route module to find suitable travel options from Oak Harbor to Portland. In August, Portland is somewhat warmer than Oak Harbor - with highs of 85°F and lows of 60°F. Cap off your sightseeing on the 25th (Sun) early enough to travel to Los Angeles. To find other places to visit, ratings, maps, and tourist information, read our Los Angeles planning app . You can fly from Portland to Los Angeles in 4.5 hours. Alternatively, you can do a combination of flight and bus; or drive. Plan for somewhat warmer nights when traveling from Portland in August since evenings lows in Los Angeles dip to 66°F. Wrap up your sightseeing on the 26th (Mon) to allow time to travel to Las Vegas. On the 26th (Mon), examine the collection at The Mob Museum, take in nature's colorful creations at Bellagio Conservatory & Botanical Gardens, and then take in panoramic vistas at Stratosphere Tower. For more things to do, other places to visit, reviews, and tourist information, you can read our Las Vegas itinerary planning website . Traveling by flight from Los Angeles to Las Vegas takes 4 hours. Alternatively, you can drive; or take a bus. Traveling from Los Angeles in August, expect Las Vegas to be somewhat warmer, temps between 101°F and 77°F. Cap off your sightseeing on the 26th (Mon) early enough to travel to Salt Lake City. To see ratings, other places to visit, and tourist information, go to the Salt Lake City online tour planner . You can fly from Las Vegas to Salt Lake City in 4 hours. Alternatively, you can drive; or take a bus. The time zone changes from Pacific Standard Time (PST) to Mountain Standard Time (MST), which is usually a 1 hour difference. Traveling from Las Vegas in August, things will get slightly colder in Salt Lake City: highs are around 92°F and lows about 67°F. On the 27th (Tue), you're off toColorado Springs. To see photos, more things to do, traveler tips, and tourist information, go to the Colorado Springs holiday builder site . You can fly from Salt Lake City to Colorado Springs in 3 hours. Alternatively, you can do a combination of flight and shuttle; or drive. Traveling from Salt Lake City in August, expect Colorado Springs to be little chillier, temps between 83°F and 56°F. Cap off your sightseeing on the 28th (Wed) early enough to travel to Dallas. Kick off your visit on the 28th (Wed): have some family-friendly fun at The Escape Game Dallas. To find photos, reviews, maps, and other tourist information, go to the Dallas day trip tool . You can fly from Colorado Springs to Dallas in 4.5 hours. Other options are to do a combination of shuttle and flight; or drive. The time zone difference moving from Mountain Standard Time (MST) to Central Standard Time (CST) is 1 hour. Traveling from Colorado Springs in August, you will find days in Dallas are a bit warmer (96°F), and nights are much hotter (78°F). Wrap up your sightseeing by early afternoon on the 29th (Thu) to allow time for travel to New Orleans. Kick off your visit on the 30th (Fri): take in the spiritual surroundings of St. Louis Cathedral and then get to know the fascinating history of Garden District. To find more things to do and tourist information, read New Orleans road trip planning app . Traveling by flight from Dallas to New Orleans takes 4 hours. Alternatively, you can do a combination of flight and car; or drive. While traveling from Dallas, expect a bit cooler days and about the same nights in New Orleans, ranging from highs of 82°F to lows of 82°F. Wrap up your sightseeing by early afternoon on the 30th (Fri) to allow time for travel to Atlanta. For reviews, photos, where to stay, and more tourist information, read Atlanta trip planner . Do a combination of car and flight from New Orleans to Atlanta in 3 hours. Alternatively, you can fly; or drive. The time zone difference when traveling from New Orleans to Atlanta is 1 hour. Traveling from New Orleans in August, you will find days in Atlanta are a bit warmer (88°F), and nights are little chillier (71°F). Wrap up your sightseeing by early afternoon on the 31st (Sat) to allow time for travel to Norfolk. Norfolk formed around a natural harbor that’s home to the world’s largest naval base, which helped cement the city as a keystone for strategic military planning and government. 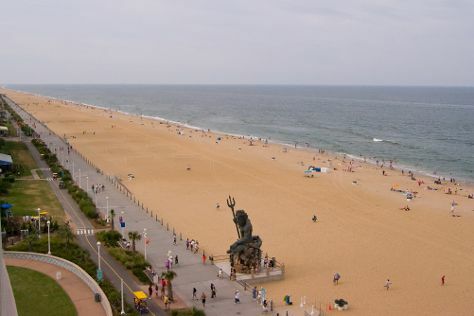 Start off your visit on the 1st (Sun): engage your brain at Virginia Aquarium & Marine Science Center, see the interesting displays at Virginia Beach Surf & Rescue Museum, then stroll through Virginia Beach, and finally take in the waterfront at Virginia Beach Boardwalk. To find other places to visit, traveler tips, reviews, and more tourist information, use the Norfolk trip itinerary maker tool . You can fly from Atlanta to Norfolk in 3 hours. Alternatively, you can do a combination of flight and bus; or drive. August in Norfolk sees daily highs of 85°F and lows of 72°F at night. Finish up your sightseeing early on the 1st (Sun) so you can travel back home.